In the age of digital having a business website is crucial with most customers now preferring to purchase goods over the internet, but finding the right hosting package to power your website isn’t always that easy. Many plans are targeted primarily at home users, and don’t have the power that businesses need. Third party or web designers? What are the hosting options? Every business should ensure the hosting provider has excellent stability so your website is online 24/7 for potential customers, additional security features that protect your customers details like SSL, PCI compliment so everything is legal and all the jazzy extras that make your website look the part, speed is also a factor that can’t be ignored, visitors will often close your page if it fails to load quickly and take their custom elsewhere. You need a host that will offer you all these fundamentals, but one that also makes everything adjustable. From pricing, to support systems, to reliability – finding the best business web hosting is no easy task. 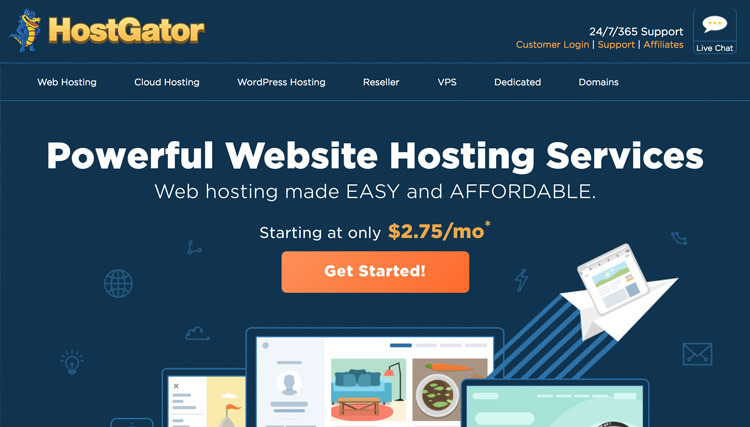 Thankfully, you’ve come to the right place and we’ve got a great guide for what you should look for and we have even listed a few sites that have been making a name for themselves as the quality business web hosts of today. As a business, your area of expertise may not be in the ballpark of web hosting. Of course, there are many articles floating around the internet giving advice and education on the subject. Most of them will suggest that you consider the following before you choose an option for you. 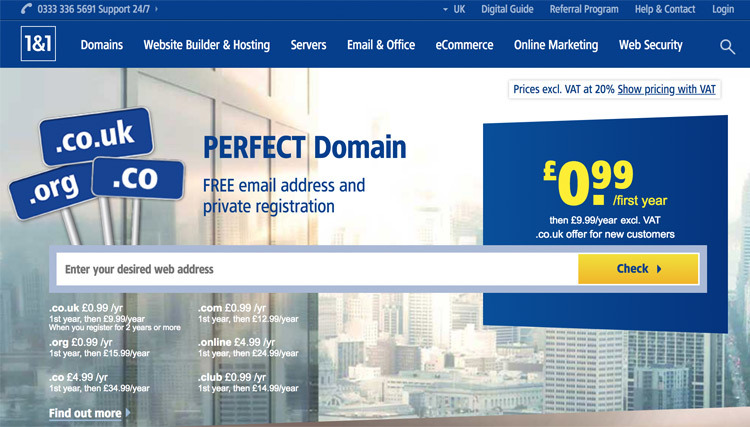 Quite a few web companies require you to own your domain in order to host with them. If you do not have a domain prior to going to them, most hosting companies will help you purchase one. Domain name registration companies are everywhere and although many of them do provide an excellent service, they should be approached with caution. You should read the terms and conditions on these sites to ensure your name isn’t sold just when you’re getting established and that the price of your domain isn’t going to suddenly skyrocket! You should also consider whether or not it is worth buying additional extensions on your name – i.e .com, .org, etc. Building your perfect website might have felt like the tough part, but there are still plenty of obstacles that have to be overcome before you’ve the perfect business webpage – of course, hosting is a key one of these. The design company you choose may offer a hosting function, but you should consider this with caution. Of course, for many, it suits, but for others it may not. After all, It locks quite a bit of your business into one company, which feels like some of the control is taken out of your hands. The small print should always be reviewed before you choose your business web host. ‘Why is that?’ you may be asking. The answer is simple – some all-in deals may have paying for elements that you don’t actually need and they may not be giving you the stuff you require. The price may rise to an unaffordable sum after a certain time limit too, as introductory offers aren’t always what they seem. An easy way to avoid this is to just ask for a breakdown of all the services and ask for individual quotes for each one of them. This way you’ll find out what you’re getting, whether or not you actually need it and what it costs. Now you know what to lookout for prior to looking for the perfect web hosting option for your business. Here are some of the great hosts who are now on the market. They are eager to help your business website move to the next level; it’s up to you whether you want to take them along on your company’s journey. Without further a do lets take a look at some of the best business hosting companies on the market, we have compared a wide range of suppliers with various prices to suit all businesses whether your just starting it up or fully operational. We’ve compared nearly a dozen hosting options in this article but our favourite firms are below for your perusal. 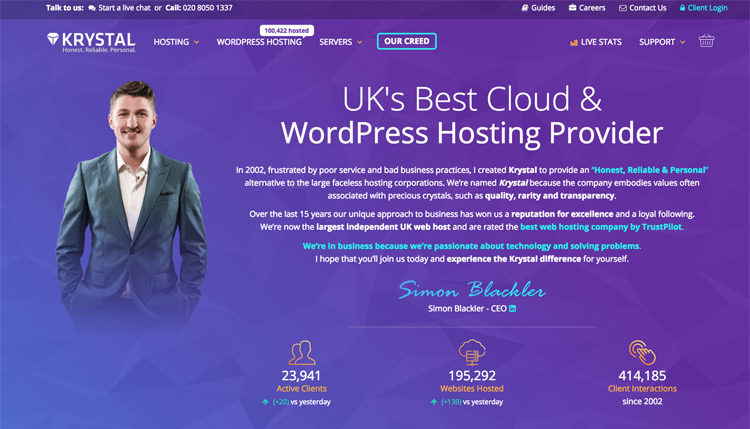 Krystal was founded by a business owner frustrated with the poor hosting options available on the market, fast forward 15 years later and they’ve been providing a quality and transparent web hosting service to thousands of happy customers. The Krystal business hosting packages are comically named with the cheapest ‘Sapphire’ starting at just £29.99 per month, the most expensive sitting at £99.99 for demanding apps or high traffic websites. In our opinion the packages are well worth their money and popular with the developer community due to the SSH access, so if you are looking to launch an app and subsequently need access to the server then this is a package suitable for you. All packages allow you to host unlimited websites with the database, mail and subdomains with no limits including free SSL certificates for added security. Krystal offers a 100% money back guarantee within 60 days for unhappy customers and the support is good to with UK based staff on hand to help with any problems. For startups, a growing business or SME Krystal should be a web host on your list to consider. Clook is not a company you may of heard of when it comes to hosting, major competitors such as GoDaddy, NameCheap and FastHosts plunge millions into advertising their firms on TV, Google and other Mediums often taking a large share of the non-tech savvy customers. Clook is a privately owned firm with a physical bricks and mortar office in the UK, Their customer review rating is unflawed with a 100% recommendation on reviews.co.uk. Having used Clook for many business ventures both past and present the firm is highly recommend, the technical support team often responds within minutes to enquiries and are highly trained to a level where problems can be sorted within a quick manner not days like many hosting providers. 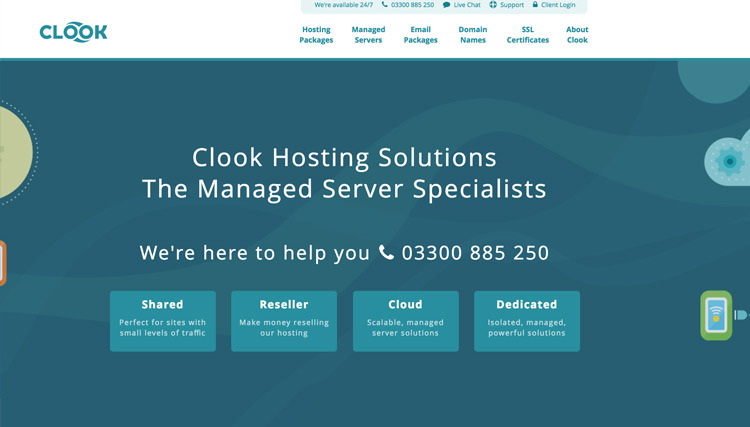 With many hosts they offer dedicated packages for businesses, but with Clook the standard hosting packages would suit many firms due to the high quality, the shared packages on offer are simple and affordable but do not compromise on speed as the servers are not over subscribed with thousands of other customers. 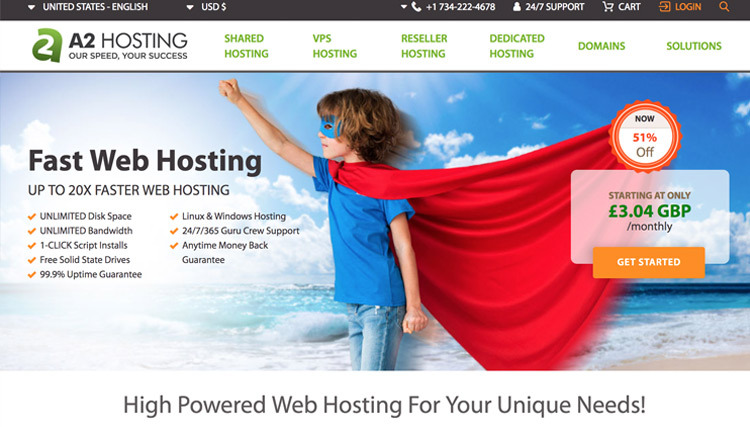 Each shared hosting package come with unlimited email accounts, an easy software installer for WordPress and 399 other applications. For businesses seeking more powerful hosting the managed standard package is perfect as it comes with spam protection, DNS clustering, 10Gbps networking and enterprise hardware not forgetting that all hardware is separate from other websites meaning if something breaks elsewhere it doesn’t pull the whole network down. The managed package The lowest priced managed package comes with 1024 memory, 25GB of SSD storage, 50GB backup space, 500GB of data transfer and 1 CPU priced at £81.50 per month with the option to add a unique dedicated ip for £1 a month. We highly recommend Clook if you’re a developer due to the highly skilled technical support team who can assist with the most complicated server issues, ssh access, Laravel Forge support and other aspects which a everyday provider would not be helpful with. 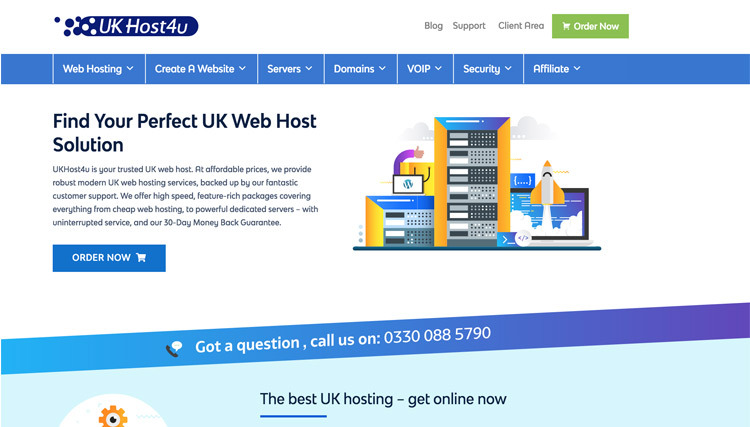 UKHost4u is a well recognised UK web hosting firm registered in Malta, they are known for their affordable packages serving the UK market. They provide a wide range of packages but as a business the Enterprise managed options may be more what you are looking for due to the hardware powering the servers being allocated dedicated resources to improve speed in conjunction with all space being powered by solid state drives. All hosting packages come with the cPanel control panel included for easy management of all the technical features such as FTP, email, databases and more. Should you encounter any technical problems with the enterprise package then the 247 technical support isi included, developers are also catered for with secure shell access to the server. Although UKHost4u is operating from Malta, the UK data centre they use for the servers is based close to London in Maidenhead which is perfect for businesses located and who have customers in the UK. 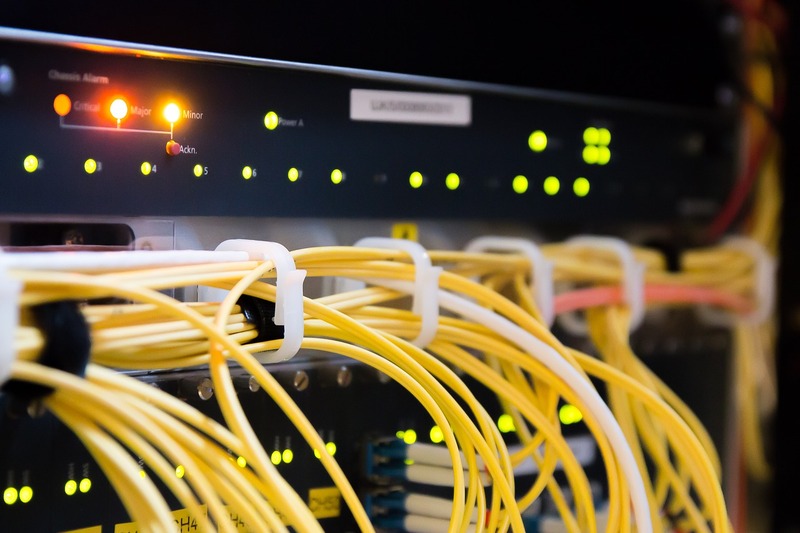 They claim that the servers are not oversubscribed with clients to ensure more performance from the hardware, this can be a real problem with cheap hosting as sometimes thousands of customers websites can be using the same hardware which can significantly slow down the site. This is a company that is renowned for their budget shared hosting services, but they also have plenty of other options available and offer a configurable business product which will surprise many. Their individual hosting options start as low as £49.99 ($70) per month, so if you’re on a tight budget and need a quality host, then this is a good option. These starter packs aren’t anything to be sniffed at either – they offer four cores, 12GM and 1000GB storage – with the option of more if it’s needed. If you’re needs are greater than that, they also have plenty of higher-end options. For instance, their X10i server gives customers 10 cores, 128GB RAM and 6TB of storage. This option also has a whole load of extras and gives users plenty of options as add-ons. Other interesting products include 1&1’s bare metal server. This is ideal for special times, when there needs to be extra resources in place. It can be prepared in just minutes and is billed by usage. 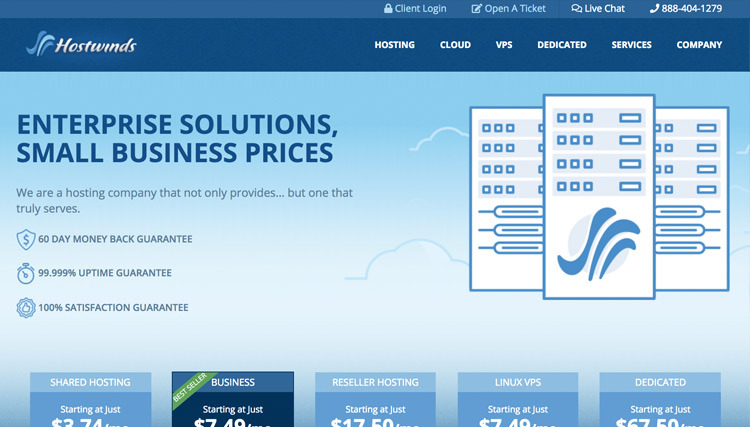 Speaking of cloud hosting, HostGator is making a name for itself in this area. If you’re looking for a basic option her, then you could do certainly do worse than them. Its ‘Business Cloud’ option is very cheap, but hits your business with plenty of business basics, such as unlimited websites, unmetered storage and bandwidth, and a private SSL certificate. There are three mirrored copies of the website spread across multiple devices too, thus if there is a hardware failure, your website can immediately be switched to another server. For businesses on a clear budget, this is a handy option; it is priced at $9.95 (£7.10) a month for up to 36 months, $17.95 (£12.80) on renewal. There are also some extras, if you need them – for instance, CodeGuard’s daily backups are available for $2 (£1.45) a month. InMotion constantly make lists like this one and for good reason too. Their web hosting services for businesses are renowned for being fast, reliable and powerful and many experts site them as the best host for WordPress built sites. Many of their plans come with a huge number of features, including unlimited disk space and bandwidth, marketing tools and security suite, plus a 90-day money back guarantee. A2 Hosting has made quite a name for itself since first appearing on the scene in 2002. Their offerings are wide and varied. 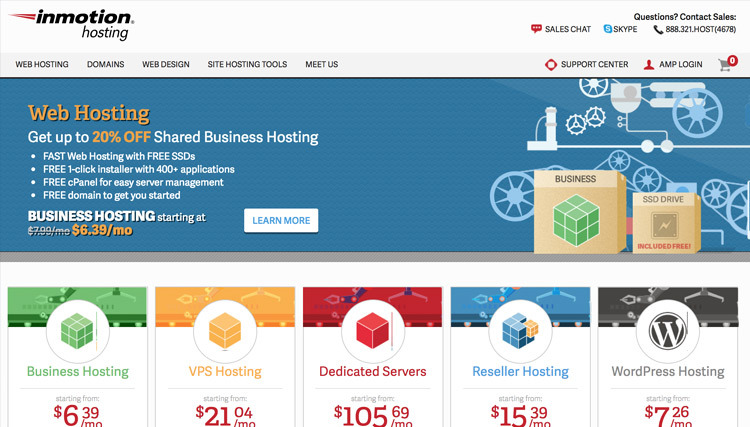 They include shared hosting, managed WordPress, VPS, cloud, dedicated, reseller, email and much more. They also have a whole bunch of optional extras avaIlable, which can improve various elements of your website, such as its security and speed. Overall, their plans are quite configurable, so you can just what you need and pay a price that suits you. The flexibility Hostwinds offers its customers has become one of its biggest selling points. They have six starter plans, which are all quite decent and can include extras, such as a 1Gbps port and nightly backupsof your website. Users can add the options they need, like extra RAM, storage and more IP addresses etc. It gives businesses the power to only pay for the stuff they actually need and it removes difficult choices, when two plans have two things you really want or need – now you can just add both and it won’t cost you a fortune! Another interesting titbit about Hostwinds is that it offers supports Windows Server 2008, 2012 and 2016. 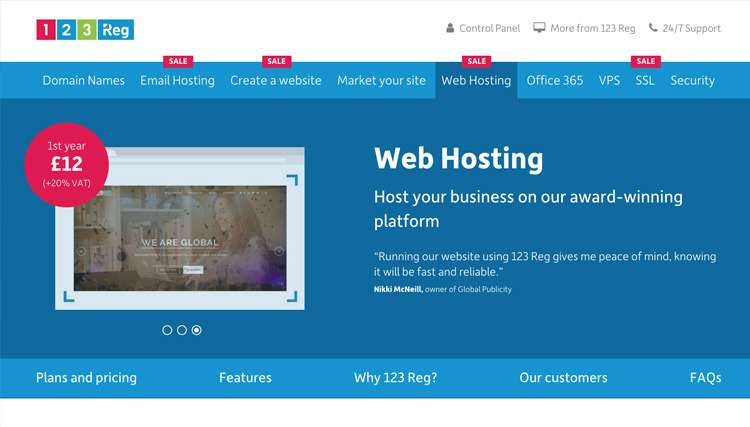 123 Reg claims to offer award winning business hosting thats fast and reliable for just £1 per month and then £6.99 thereafter, the package is named ‘Business’ and comes with 100GB of space and the ability to host 2 x domains on the server. Our review of 123 Reg is not a good one having had prior experience working with the firm, they are hands down one of the worst businesses we have worked with, the support is horrific to say the least and the feeling you get when speaking with the customer support team via email is that the initial staff have zero to little knowledge of web hosting, we would even go to say that they are not based in the United Kingdom but outsourced to Asia which is confusing as a business proclaiming to be based in Britain. Having said that the company does offer cheap hosting services which in many cases are perfect for startups with little to no funds. You now have a good selection of hosting options for powering your business forward that are not only affordable but of decent caliber . We urge you to make no hasty decision although many of the hosting firms we have compared do have money back guarantees, it pays to do your own research and seek the answers to any additional questions you may have with the sales team first.